We get enamored with origin stories. Just recently, Wicked celebrated becoming the tenth longest running show in Broadway history. And right down the street, another origin story inspired by "The Wizard of Oz" is capturing hearts. And that show is The Woodsman. 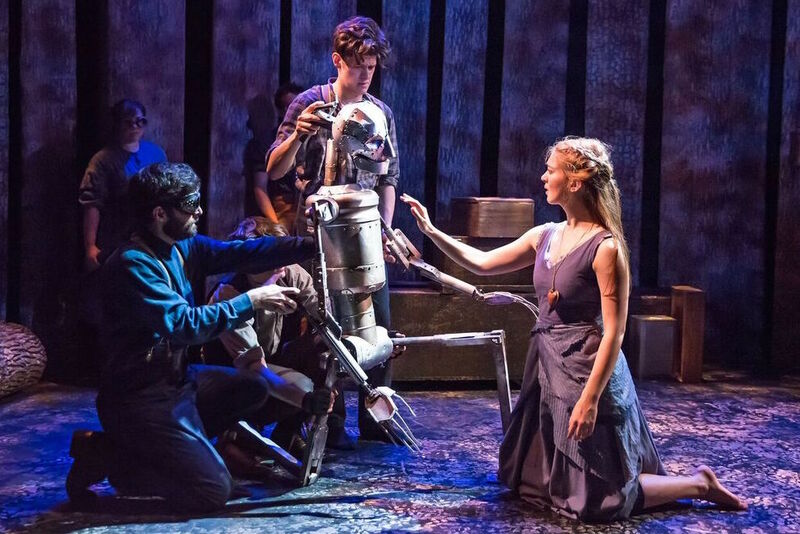 Inspired by the story of the Tin Man, The Woodsman is a beautiful reimagining of a beloved tale using puppets, song, and a whole lot of heart. Conceived by James Ortiz, directed by Ortiz and Claire Karpen, with music by Edward W. Hardy and lyrics by Jen Loring, The Woodsman follows Nick Chopper, a munchkin who falls for a beautiful young girl named Nimmee, who happens to be under the control of an evil witch. As their romance kindles, the Witch, knowing she’ll lose her girl, casts a spell on the axe that ultimately mutilates Nick Chopper, turning him into a mechanical being with a broken heart. Using very little dialogue, extraordinary puppets, a singular violin underscore, and an ensemble of superb storytellers, The Woodsman is a reminder that anything is possible in theater. The story is simple. Rather than trying to do too much, Ortiz relies on an accessible story, giving just enough information for the audience to come along for the ride and allow our imagination to roam free. And getting an opportunity to harken back to childhood is always welcome. When it comes to origin stories, what sets The Woodsman apart from something like Wicked is rather than pandering and throwing in nods to what the audience knows, The Woodsman unravels naturally, allowing for that singular nod at the end to be well earned. With little dialogue to speak, crafting this story was all in Ortiz’s vision. Ortiz and Karpen intricately choreographed each beat. Everything flows seamlessly. There’s never a moment where the momentum halts. And that’s important. The Woodsman strives in stagecraft. Ortiz and his team allow the story to take shape sans spectacle. Sure, there are extravagant moments but they serve to further the story rather than distract. It’s a brilliant directorial choice. With theatricality being an integral part of the show, the puppets were the official stars of the show. Designed by Ortiz himself, the puppets have a blend of practicality and necessity. The marriage between the lighting design by Catherine Clark and Jamie Roderick and scenic design by Ortiz, again, was a happy one. The set stylishly included wood textures without becoming overwhelming. And extending the elements into the audience added an inclusive touch. The Mason jar lighting fixtures transported the piece to a special place. The way they were incorporated, serving as flicking bugs or a glimmer of the Emerald City, was stunning. Ambiance was an important part of creating the world and the production’s soundscape, even during the preshow. Defining the atmosphere in this worldless piece was executed well. With Steampunk elements in Molly Seidel and original costumer Carol Uraneck’s design, the costumes paid homage to what we know from the source material while still standing on its own. The Woodsman is a true example of ensemble. The nine piece company moved and breathed as one. And it was enthralling. The Woodsman is clearly a passion project for James Ortiz. So much so that in addition to all of the other hats he wears, he portrays Nick Chopper himself. In any other situation, this would be a recipe for disaster, but with the intricacies being what they are, playing Nick as well worked ok. While he may have been the titular character, the work from the rest of the ensemble should be celebrated. Eliza Martin Simpson is simply striking as Nimmee. Simpson radiates confidence on stage. Some of the most lovely and touching scenes are the romantic duet scenes with Nick and Nimmee. I dare you not to smile. 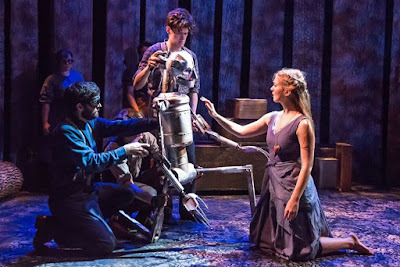 Puppetry plays a big part in The Woodsman and the duo of Amanda A. Lederer and Sophia Zukoski operating The Witch almost faded away breathing life into the puppet. Naomi Florin, the expert violinist, was a wonderful presence and the unsung hero of the production. The music by Edward W. Hardy was tastefully simple yet played a pivotal role setting the mood. The Woodsman is a family-friendly wonder that triumphantly brings theater and storytelling together. The production has been on an amazing journey and deserves a long life. The only struggle The Woodsman will encounter is what happens when Ortiz departs the production. Will the heart still be there or is this a vehicle made for one?